To enter into administrative service or become deputy commissioner of Amritsar during the time of the British Government, it was mandatory for the ICS officers to clear the comprehensive test based on the Punjabi Baat Cheet, a book specially written for the British to understand the local dialect. The recent bonhomie between India and Pakistan has not only served to strengthen ties between the two countries and its public but has also thrown open a vast arena of contrasts and comparisons. It was a homecoming for painter Jaswant Singh who held his second solo exhibition here after a gap of 27 years from March 11 to March 13. Born and brought up in Tung village near here, Jay Jaswant Singh, as he is popularly known in the USA and Canada, said his aim in holding this exhibition here was to make people of his area conversant with this work. The 98-year-old Kesar da Dhaba, located in the narrow lanes of the walled city, has become a must-visit eating joint for visitors desirous of savouring Punjabi delicacies. Even Pakistani cricket lovers, who had arrived to watch the first Test at Mohali, were seen thronging the shop during their sojourn here. Artificial jewellery manufactured in the holy city has caught the fancy of fashion-conscious people of Pakistan. It is now a big craze among the younger generation of the neighbouring country of Pakistan. The interest shown by Pakistani visitors in making bulk purchases of artificial jewellery manufactured in the city has bolstered sales. A team from the Manchan Arts and Research Centre, Mumbai, has arrived to stage a play Hum Dono in the city. The play is scheduled to be held on March 18, 19 and 20 at the Natshala here. In a land where female foeticide is prevalent, daughters performing last rites of their father is a bold example of break-away from the formal restrictions imposed on women. It is a unique attempt of residents of the local Kabir Park locality who have opened the Bhagat Kabir Library in the gurdwara situated in the area to inculcate moral values among youth. Dr Devinder Singh, 76, is a senior member of the Amritsar Bar Association. He has to his credit a cumulative experience of about 52 years of practice at District Courts, Jalandhar; Punjab & Haryana High Court and local Courts and law teaching experience in Guru Nanak Dev University. Dr N.S. Neki, Associate Professor Medicine, Department of Medicine, Government Medical College, Guru Nanak Dev Hospital, has been elected member of prestigious National Academy of Medical Sciences, New Delhi, in the subject of internal medicine. The Punjab Council of Art and Literature organised "Sahir Ludhianvi Nite" in the memory of Sahir Ludhianvi at the local Naatshala theatre yesterday evening. The evening started with Sahir's favourite number Main Pal Do Pal Ka Shayar Hoon rendered by Kajal, an eminent local artiste, followed by Allah Tero Naam. The Tarksheel Society staged a play Dev Purush Haar Gaye at Government Secondary School, Town Hall, recently. The message of the play was to expose the claims of the so-called god men. DAV International School here organised its annual crafts exhibition recently on the theme "Water — the elixir of life". The exhibition aimed at highlighting various uses of water. Former Chief Election Commissioner and MP, Dr M.S. Gill, donated Rs 10 lakh to Khalsa College for upgrading the library and laboratories during the 99th convocation of the college. Strange but true. The first Hindi novel was written in Amritsar in 1888 by Pt Shardha Ram Phillauri. He also wrote the masterpiece Om Jai Jagdish Hare, a hymn which is sung in Hindu households across the country. This was perhaps the first book written in Gurmukhi script which was transliterated into Roman script. 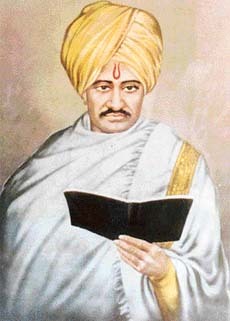 The unique book was written by Pandit Shardha Ram Phillauri, a versatile personality. Only a few people are aware of the fact that Shardha Ram was the creator of the most popular prayer (aarti) Om Jai Jagdish Hare…, sung by almost every Hindu family the world over. He was a powerful literary figure of the 19th century. Incidentally, his book became the first book on Punjabi linguistics which mentioned ‘folk-culture’, customs of Majha region (Amritsar and Gurdaspur) and other parts of the state, including adjoining hilly areas. A reader can find many rare words in Punjabi Baat Cheet which have disappeared from Punjabi dictionary. Sikhan De Raj Di Vithia and Punjabi Baat cheet are two notable works of Shardha Ram in (Gurmukhi) that earned him the title of “Father of modern Punjabi prose”. The books contain the story of the Sikh religion and politics. Pt Shardha Ram Phillauri was born in a Brahmin family at a small town Phillaur in the year 1837. He was married to a Sikh woman Mehtab Kaur. He had learnt Gurmukhi script in 1844 at the age of seven. Later, he learnt Hindi, Sanskrit, Persian, astrology and music in 1850. He met Christian priest Neutan in 1858 and translated one part of Bible in Gurmukhi for the first time in 1868. He wrote controversial book, Sikhan De Raj Di Vithia ( The story of Sikh rule) in 1866. He died on June 24, 1881 at Lahore. His father, Jai Dyalu, was an astrologer by profession. Pt Phillauri himself was a great astrologer and frequented Amritsar in this connection. He was charged with conducting propaganda against the British Government through his forceful lectures on the Mahabharata and was exiled for some time from his home town, Phillaur. A Sanatani missionary born in Phillaur, near Ludhiana, he used to visit Amritsar and its adjoining illustrious city — Lahore — very frequently. Pandit Brij Kishor Sharma, an Ayurvedic doctor, writes that Shardha Ram Phillauri would frequently visit Amritsar city in connection with astrology. He had earned a big name as astrologer in Amritsar during those times. A social reformer and trendsetter, as he was called, he had written a number of books in Hindi too. The findings of Dr Bedi that Pt Phillauri’s creation, Bhagyawati, was the first Hindi novel, have compelled the rewriting of the history of Hindi novel. Dr Bedi says that Bhagyawati publication dates back to 1888 and most of its part were believed to be written in Amritsar. Earlier, Priksha Guru, written by Lala Sri Niwas in 1902 was considered as the first Hindi novel. However, the Granthawali by Dr Bedi revealed that the first Hindi novel was written 14 years before Priksha Guru, that too on the land of Vedas (Punjab). By that time, most of the writers had not even heard the name of Shardha Ram Phillauri. That was why no publisher was ready to print the voluminous Granthawali. However, when the comparatively little known “Nirmal Publisher” published the same, it came as pleasant surprise for the Hindi lovers that helped in re-writing the history of literature. The findings of Dr Harminder Singh Bedi, Dean, GNDU, that Pt Phillauri’s creation, Bhagyawati, was the first Hindi novel, have compelled the rewriting of the history of Hindi novel. Dr Bedi says that Bhagyawati publication dates back to 1888 and most of its parts were believed to be written in Amritsar. Earlier, Priksha Guru, written by Lala Sri Niwas in 1902, was considered the first Hindi novel. Interestingly, the book used to be given to daughters at the time of their marriage as a part of the dowry. It is just a coincidence that the first Punjabi novel Sundri, authored by Bhai Vir Singh, was written a decade after the publication of Bhagyawati. The main character of both novels is a woman. It was a revolutionary step on the part of Shardha Ram to advocate widow marriage and condemn child marriage in Bhagyawati. From both first novels of Hindi and Punjabi, it is clear that a movement for women’s emancipation was launched from Punjab. On the birth of a female child, Bhagyawati, the main character in the novel, makes her husband understand that there is no difference between the male and the female child. Earlier, as per Hindu customs a widow’s status as an unwanted burden was also a result of the taboos that prevented a widow from participating in the household work as her touch, her voice, her very presence was considered “unholy, impure and something to be shunned and abhorred”. Thus, without her husband a woman’s existence was not tolerated and an extreme but logical outcome of this was immolation by widows. Similarly, during those dark days child-marriage was common. Newly-born girls used to be killed by drowning them in a tub of milk. But through Bhagyawati, Shardha Ram made earnest efforts to create awareness about women’s emancipation. The comparisons that got highlighted the most were woven into poetic verses by writers and poets on either side of the border. These comparisons were drawn especially between people belonging to the pre-Partition twin cities of Amritsar and Lahore. Poets rehearsed verses of sanjh (togetherness and sharing), common air, wind and water. Interestingly, another comparison, too, was drawn. “The value of currency notes in the two countries may fluctuate, but the condition of currency notes in both Lahore and Amritsar remains similar,” remarked an observer, adding that both cities were famous for their mouth-watering Punjabi cuisines and sweets. “The effect of such lip-smacking meals is clearly evident from ‘soiled’ currency notes on either side of the Wagah,” he sallied. Another observer remarked, “Torn ends, notes joined by cellophane tape or gum is a common sight in Amritsar.” When this correspondent visited Pakistan recently, the notes in Lahore, too, showed similar ‘creative handling’. It was a homecoming for painter Jaswant Singh who held his second solo exhibition here after a gap of 27 years from March 11 to March 13. Born and brought up in Tung village near here, Jay Jaswant Singh, as he is popularly known in the USA and Canada, said his aim in holding this exhibition here was to make people of his area conversant with this work. So, he had not put any price tag on his paintings. His 33 paintings which adorn the walls of the local Thakur Singh Art Gallery were inspired by the teachings of Sikh Gurus and Sufi saints. For instance, painting titled Song of the Night depicts a child moving towards horizon with holy word Waheguru imprinted everywhere. About his paintings he says, "Having traversed various stations in my life, the conflict within encouraged me to create these works. These paintings have been inspired by the sacred hymns of Sikh Gurus, poetic compositions of Nath-Yogis, spiritual writings of Sufi saints and the Punjabi folklore." He felt that translating his spiritual and worldly experiences into images through various media and techniques, using symbols, words and images in bold colours, he was being close to the divine. 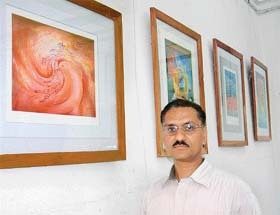 Jaswant Singh, after completing his schooling from the village school, earned his degree in painting at the College of Art, Chandigarh. He painted the landscapes of foothills of Himalayas and the rural life of Punjab in his paintings at that time. Later, he moved to Nepal, where he painted large murals and paintings for prominent five-star hotels in and around Kathmandu. Subsequently, he went to East Africa, where he painted African wildlife in water colours, acrylic and oil. He has exhibited in over 50 solo, group and art exhibitions across the globe. Besides, he is a member of the Portrait Society of America, Florida, the New York Artists Equity Association, the Williamsburg Art and Historical Center, New York and the Southampton Artist Association, New York. In the beginning of this year he moved to Toronto from New York where he lived for six years. Terrance Lindall, Vice-Chairman, The Society for Art of the Imagination, London, says: "These paintings are poems drawn on canvas in bold fascinating colours. The enchanting marriage of poetry and art beckons us to enter a garden of beauty and truth where we listen to unsung melodies and drink nectar from the unfathomable ocean of the Divine. Influenced by Guru Nanak's philosophy, these images open sacred doorways into another world, where the artist walks, flies and swims with symbols, forms, words and colours, singing Waheguru — in unsung ragas." The 98-year-old Kesar da Dhaba, located in the narrow lanes of the walled city, has become a must-visit eating joint for visitors desirous of savouring Punjabi delicacies. Even Pakistani cricket lovers, who had arrived to watch the first Test at Mohali, were seen thronging the shop during their sojourn here. Mr Liaqat Ali, a businessman from Lahore, said vegetarian cuisine available at the shop was the most delicious food he had ever tasted. Mr Vijay Kumar, better known as Babbi Pehalwan of the dhaba, one of the proprietors of the dhaba, said his grandfather late Lal Kesar Mal migrated from Shekhupura, now in Pakistan, and established the shop in 1916 here. At that time only parantha and mah ki dal (urrad ki dal) was available at the dhaba, and dal was served free of cost with paranthas, he added. Gradually, more and more eating items were added to the menu list. Presently, as many as 23 items are being prepared. Customers are served the food in 'thali' (plate system), which comprises two paranthas, mah ki dal fry, cholle and rayta all for Rs 43. The dhaba has some 25 workers preparing and serving meals to the customers three times a day. However, what makes its items unique is the recipe, which its owners themselves prepare to keep intact the original flavour. Mr Ramesh Kumar, fourth-generation owner of the dhaba, said that besides keeping original flavour intact, they had also kept the old sitting arrangement intact to give the shop a traditional touch. There are marble tables, and wooden stools are used for sitting. He added that they did not want to change the old style of the shop but said that keeping pace with the changing time they would open a new branch in the civil area. Celebrities like late Indira Gandhi, late Giani Zail Singh, Yana Gupta, Manpreet Brar, Liza Ray, Yash Chopra, Uttam Singh and many more had visited the dhaba from time to time to savour delicious Amritsari food there. Mr Ramesh Kumar said that on demand of famous personalities staying in the city hotels, packed food was made available to them. Almost all private news channels have 'shown' the shop in their programmes. Besides, the BBC has also beamed a documentary on it. Visitors from Pakistan recently purchased a good number of artificial jewellery items during their visit to the holy city. With the opening of the border, a number of visitors visit the local Chutha Bazaar, situated close to the Darshani Deori in the periphery of the Golden Temple. It is one of the main markets dealing in artificial jewellery. The merchandise looks so genuine and original that one can easily be fooled here! Artificial jewellery is manufactured at a large scale here. American diamonds and kundan jewellery have become a hit among the people crazy for showing off, especially during marriages and celebrations. The annual turnover of jewellery items is estimated to be several crores. The artificial ornaments, manufactured locally, have attracted buyers from various parts of the world. Mumbai (read Bollywood) is one of the main markets where these jewellery items are much used. The history of artificial jewellery manufacturing and trading goes back to 200 years when a large market behind the Akal Takht was set up by a local enterprising businessman. The artificial jewellery is so beautifully crafted that it becomes difficult to differentiate between this jewellery and the original gold and diamond jewellery. "It is a jewellery of middle class," said Ms Harvinder Kaur, a resident of Delhi, who was here to purchase artificial jewellery. "Even the high-class people have started wearing this jewellery to have different variety, as it is not possible to procure a new set of jewellery for every occasion and function," she added. This trade got momentum in the last few years. "With rising prices of gold jewellery and decreasing profits, more and more jewellers have become inclined towards manufacturing artificial jewellery," said Mr Arun Seth, popularly known as Billa Seth, who is one of the main manufacturers and dealers in artificial jewellery. 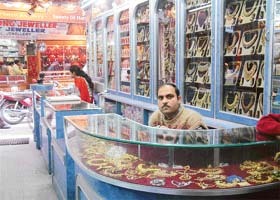 Mr Seth said that a number of Pakistani tourists, especially women and girls, visited this bazaar for buying jewellery. He said that in the market, they sold jewellery to Pakistanis with special discounts and gifts. Even NRIs visiting the Golden Temple visit the Chutha Bazaar for purchasing these ornaments. In fact, Amritsar is emerging as one of the biggest suppliers of this jewellery. However, like other trades, this also had to face bad days during terrorism. During Operation Bluestar in 1984, half of the total shops of the market were destroyed, and later in 1988, these shops in the Chutha Bazaar came under the Galliara Project, which again marred this business. 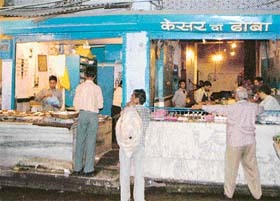 Some of the shops were shifted to the IDH Market near the bus stand. Most of the craftsmen manufacturing artificial jewellery are from Bengal. Mr Surinder Jain, a shopkeeper in the IDH Market, said artificial jewellery ranged from Rs 25 to Rs 8,000, depending on the material used. He said dulhan sets, jewellery fitted with artificial stones, necklaces, chains and nose pins were in great demand. However, the alleged wrong policies of the government were playing havoc with this business. Mr Seth opined that this trade, which provided employment to many people, should be brought under small-scale industry. He said sale tax on artificial jewellery was much more than that on gold ornaments. He added that they were giving 8.8 per cent sale tax on artificial jewellery, while it was only 1 per cent on gold ornaments. Based on Arbusev's Russian play The Old World, the play revolves around two old people with diverse personalities. The play dwells on the feelings of the old people, particularly the lonely. The play has been adapted by Dinesh Thakur, a renowned film actor and theatre personality. Talking to this correspondent, B.P. Singh, director of the play, said that as was clear from the title Hum Dono, there were only two artistes on the stage. The character of Sarita was being played by Dr Ekta Kaur and that of Dr H.P. Singh by Kunal Sharma. Lakha Lehri from the theatre department of Punjabi University, Patiala, has designed the set and lights for the play. The director of the play himself hails from the holy city. He has been into theatre in Chandigarh, Delhi and Amritsar. These days, he is pursuing his passion in Mumbai. He said Amritsar had to its credit the continuity of theatre right from the Independence. He said more than 300 productions, including those from Chandigarh, Patiala, Delhi and even teams from Pakistan, had performed at this Natshala. Ms Laxmi Kanta Chawla, BJP State Vice- President, attended the cremation, havan and other ceremonies that were performed by daughters of engineer Dev Raj Malhotra recently. Even though many questions arose over the propriety of the performance of rites, but Ms Kanta, whose brother-in-law Dev Malhotra expired in Pathankot, supported the daughters and the son-in-laws taking over the religious ceremonies. The family has no son and only three daughters. While many insisted that in the absence of son, the rituals and ceremonies attached with death could only be performed by brother or nephew of the deceased, Ms Kanta took a bold step and supported Ms Kavita, Ms Gopi and Ms Pooja — three daughters of the deceased — and their respective husbands, who also performed the rites. Despite the fact that the daughters were objected to at the cremation ground by the caretaker and pandit and even some people, the rites were performed. On the chautha ceremony also, the daughters and their respective husbands performed the traditional havan. Later, the sons-in-laws took the ashes of their father-in-law for immersion in the holy Ganga. Ms Kanta stated that when daughters took all responsibility of the family, no one had the right to keep them from performing the last rites of their father. Ms Gopi, one of the daughters of the deceased, stated that she had one daughter and needed no son. Many BJP leaders attended the ceremony at Pathankot. The main feature of this library is that all books have been donated by various Sikh intellectuals and personalities residing in the area. A book bank of 500 books has been set up. These include literature on the Sikh Gurus. Some books in Urdu, too, have been arranged for the older generation that still prefers reading Urdu text. Some of the rare books include Zafarnama (Urdu), Index of Guru Granth Sahib by Akali Kaur Singh. Mr Chanchal Singh, library in charge, said the idea of opening the library was that of Dr Jasbir Singh Sabar, a famous literary personality and professor and head of Guru Ravi Dass Chair, Guru Nanak Dev University and resident of the area. The thought first came up during the weekly get-together at the gurdwara. Finally, the library was opened on March 13. It is being run through voluntary contributions. The in charge said that they would encourage parents to send their children to the library. Mr Chanchal Singh said they would also subscribe to important newspapers, journals and magazines for the library. Dr Devinder Singh, 76, is a senior member of the Amritsar Bar Association. He has to his credit a cumulative experience of about 52 years of practice at District Courts, Jalandhar; Punjab & Haryana High Court and local Courts and law teaching experience in Guru Nanak Dev University. From 1973 till his retirement in 1989, he was a regular member of the law faculty. During this period, he had published several articles in journals, including Criminal Law, Journal of the Bar Council of India, Social Defence of the Govt. of India, University's Law Journal. He also gave his expert comments on radio and television on topics ranging from Constitutional amendments to probation of offenders and clemency powers of governors. "I offered free telephonic assistance to the needy regarding matrimonial matters and maintenance under Section 24 of the HMA and Section 125 of the CrPC. I received about 100 calls from Punjab, Haryana and Delhi. This was my own way of social service to the needy, who could open their heart while sitting in their own home," he says. Guru Nanak Dev University conferred on him a Doctorate in Philosophy of Law (PhD) in 1983, terming his research work as excellent, most exhaustive and commendable. He is also editor and revising author of half a dozen law books on civil, criminal and constitutional matters. He says, "It is a matter of great satisfaction that I could edit the Constitution of India, a scholarly treatise by my own teacher, Professor C.L. Anand of Panjab University Law College then situated at Jalandhar." During the Akali Morcha in 1961, he was entrusted the task of defending Akali leaders, including the renowned S. Atma Singh of Kapurthala, who later became cabinet minister. He created history by being the only law graduate in the country, who was enrolled for the PhD without possessing the master's degree in law. About the holy city of Amritsar, he says that he feels doubly honoured to live here as a permanent resident. "It is a sacred city and my grandfather Bhai Thakur Singh Ji Gandh and my father were born and settled here in Gali Gandanwali, near Nimakmandi, before they shifted to Lahore for practice at the Bar," he says. Dr N.S. Neki, Associate Professor Medicine, Department of Medicine, Government Medical College, Guru Nanak Dev Hospital, has been elected member of prestigious National Academy of Medical Sciences (NAMS), New Delhi, in the subject of internal medicine. Dr Baljeet Singh Dhillon, Chairman, Punjab State Medical and Dental Teachers' Association (PSMDTA), stated in a press release that the academy would confer an award on Dr Neki during its 44th annual function in Mumbai on April 30. Dr Neki has received fellowships of 22 medical societies, including national and international medical societies. He is a life member of the International College of Nutrition. He was also awarded the Shiromani Bhagat Namdev Award by the All India Shiromani Bhagat Namdev Society. Dr Dhillon said that Dr Neki was presently in the National Advisory Board of the Journal of Indian Academy of Clinical Medicine and also former member of the National Advisory Board of the Journal of Indian Society of Cardiology. The Punjab Council of Art and Literature (PCAL) organised "Sahir Ludhianvi Nite" in the memory of Sahir Ludhianvi at the local Naatshala theatre yesterday evening. The evening started with Sahir's favourite number Main Pal Do Pal Ka Shayar Hoon rendered by Kajal, an eminent local artiste, followed by Allah Tero Naam. A number of TV and AIR artistes, including Anil Kumar Razdan and Ginny Razdan, regaled the audience with duet Phir Na Kije Meri Gustakh Nigahhe Ka Gila, while another artiste Surinder Kakkar added a fresh touch to the programme by singing famous song Yeh Duniya Agar Mil Bhi Jaye to Kaya Hain which focussed on the tragedy and spirit of Sahir. Another prominent singer Surinder Chopra enlivened the evening by singing Dev Anand's favourite number Main Zindagi Ka Sath Nibhata Chala Gaya. The chairman of the council, Dr P.S. Grover, and Pushpinder Grover said the aim of the council was to educate the new generation about the contribution of famous poets, writers and novelists who had enriched the Punjabi composite culture. He said the PCAL had decided to organise programmes on four Punjabi artistes, including Sahir Ludhianvi, Nanak Singh, Shiv Batalvi and Gulzar. The Tarksheel Society staged a play Dev Purush Haar Gaye at Government Secondary School, Town Hall, recently. The message of the play was to expose the claims of the so-called god men. It demonstrated that these people cheated innocent and gullible persons when the latter were in distress. Written by veteran stage artiste Gursharan Singh, the play unfolds when a depressed person approaches a so-called god man with the hope of finding a panacea for his family's woes. The god man begins to exploit the man. It is only the intervention of some learned persons that helps the family resolve its problems in a rational manner. Members of the society also performed feats like walking on burning coals. They told the audience that feats like these were not done with the help of any magical powers; they were done using some chemicals. Several rooms with individual themes were decorated with hand-crafted projects by students to throw light on the theme. Projects about snow-covered peaks of the Himalayas and the unending snowy-lands of Antarctica and Arctic and various expeditions that were flagged off to these southern and northern axes of the earth were shown during the exhibition. The mysteries of the deep sea complete with life on beaches, and animals and sea horses, besides whales and sharks were also shown in the projects. Varied hues of water, as it changed from black, deep blue and green to turquoise, added to the beauty of the exhibition. Another project showed the journey of river with its twists and turns, colourful flowerbeds and the gift of rainy season. However, as Ms Neera Sharma, headmistress of school, said the picture was incomplete without the depiction of the destructive and devastating effects of water. Addressing students on the convocation, Dr Gill told them that they must take science and technology as subjects. He said the coming era would usher in a huge economic potential and offer better career opportunities for the students with technical background. Strongly advocating the empowerment of women, he said the education of women was the key to the progress of any country. Dr Gill honoured old students of the college, including Mr G.S. Narang, Commissioner, Central Excise. Later, Principal, Khalsa College, Dr S.S. Bawa, presented the annual college report. At the 33rd annual convocation of the BBK DAV College for Women here, Dr Amrik Singh, former Vice-Chancellor of Punjabi University and eminent educationist, awarded 925 degrees to graduate and post graduates students of the college. Dr Amrik Singh, while delivering the convocation address, said the higher studies should provide innovative education and vocational skills to make women self-reliant. Dr S.P. Singh, Vice-Chancellor, Guru Nanak Dev University, delivered the presidential address. The college students presented a cultural show at the end of the convocation. Later, Principal, Ms J. Kackria, read out the college report. Governor of Kerala, Mr R.L. Bhatia, presided over the annual convocation of the Guru Tegh Bahadur College for Women here. Delivering his convocation address, Mr Bhatia stressed the role of women in shaping the destiny of the country. He said the women were excelling in all walks of life these days. Principal of the college, Mr Nanak Singh, while welcoming the chief guests presented the annual report. Degrees to more than 500 graduates and postgraduates were awarded on the occasion. A Spice Telecom showroom was inaugurated in the city by Mr Navin Kaul, CEO. Speaking on the occasion, Mr Kaul said the showroom would be a high-quality retail point and it would provide its customers with world-class customer care services. He also announced the launch of Priyanka's Limited Edition Team Pack for pre-paid subscribers. He said the Spice had over 9,000 retail outlets across Punjab.